It’s a fact that statistically, young male drivers are far more likely to be involved in a road traffic accident on UK roads, than any other category of motorist. As an organisation with a mandate to campaign for improved safety in all aspects of motoring, the RAC was keen to find a way to engage with these drivers face to face; a notoriously difficult thing to achieve. The RAC Drive Alive Roadshow was conceived as an innovative and highly flexible mobile campaign that could be deployed across the UK, quickly and easily. We understood from the outset that our target audience was unlikely to respond well if they felt they were being “preached” to, so it was important to create a fun, interactive environment where the range of skills and attention levels required to control a car safely could be demonstrated. The RAC Drive Alive Roadshow was based around a large, specially design truck, fitted out by us and manned by a team of trained promotional staff. Visually impressive both on the road and when set up, the Roadshow included a range of console-based challenges (popular with our target group), devised and created to test hazard perception and reaction times. Other games tested awareness of other potential risks including drugs and alcohol. Promotional leaflets were distributed and a prize draw element was built in. The Roadshow also acted as a publicity and recruitment platform for RAC subsidiary British School of Motoring (BSM), promoting driving lessons for learners and advanced courses for drivers. 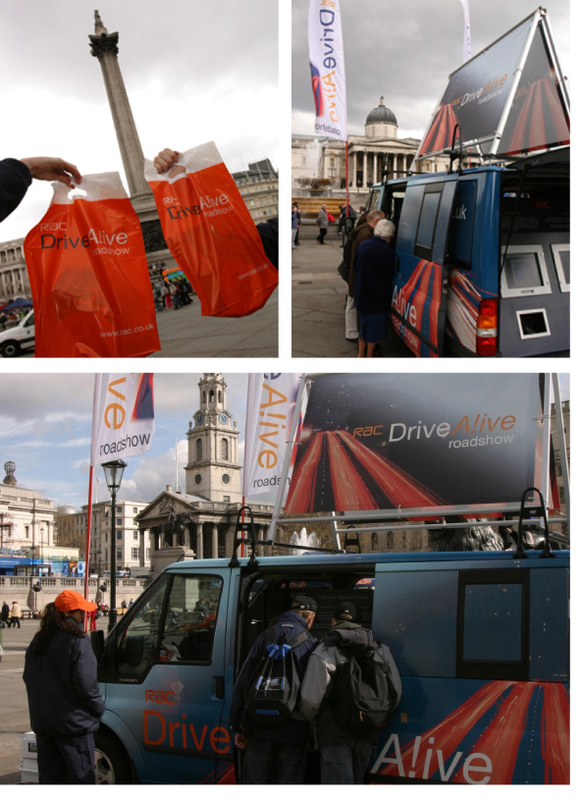 For maximum publicity, the Drive Alive Roadshow was launched on World Health Organisation Day at Trafalgar Square in central London, attracting considerable interest from invited media and the general public. The Roadshow went on a busy summer tour of the UK, visiting venues including car shows, rail stations and shopping malls to be seen by hundreds of thousands of people.